How do I bind and retrieve a character using my email? The only payment method we currently support is through Apple iTunes. There are many reasons why applications crash. Many times it is due to memory use on your phone. Please try the following: Clearing your Safari Web Browser Cache, Update the app, Making sure no applications are running in the background by pressing the “home” button twice, and sometimes switching from Wifi to LTE/3G/4G helps as well (or vice versa). We do not support jailbroken devices. How do I bind a character using my email? As of 4/16/14 this feature is no longer available. You will need to use the Game Center or Google Play App to transfer accounts. How do I sync my account to Game Center? Step 1: Make sure you are logged into game center by going to Setting, tapping Game Center and tapping your account at the top. Step 2: Simply start Underworld Empire. 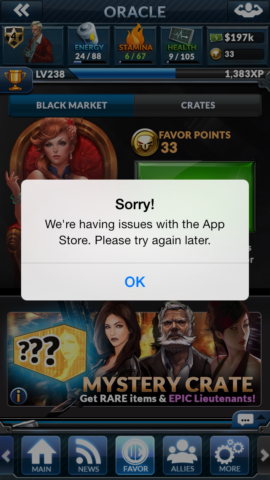 Any time you start up the game your account will automatically be synced to Game Center. 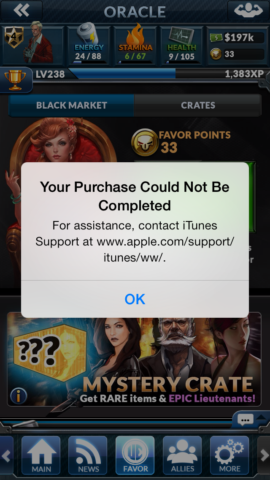 How do I retrieve my account using Game Center? Step 1: Go to the "More" tab by clicking the gears on the bottom left of the game's home screen. Step 2: Click the option that is titled "Character Transfer." Step 3: Find and tap your desired account. Note: When you log into a Game Center Account and access Underworld Empire, the account you are currently on will be bound to that Game Center ID automatically. 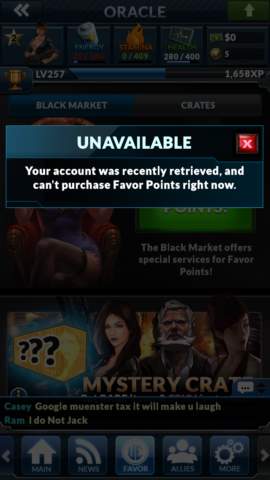 How long after retrieving my account until I can purchase Favor Points? There is a 48 hour wait period from the time of account retrieval until players are able to purchase favor points. This has been implemented in order to increase account security. How long after retrieving my account until I can transfer my account again? There is a 2 hour wait period from the time of account retrieval until players are able to transfer their account again. This has been implemented in order to prevent exploiting. Last edited by UWE_Tank; 05-19-2015, 05:55 PM.